One of my predictions for 2013 was that we would see increased adoption of alternative fuel vehicles this year, including trucks powered by natural gas. The news from recent days and weeks suggests that this prediction is coming true. One of the key constraints in using natural gas trucks for long-haul shipments is the lack of filling stations. 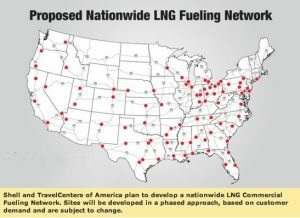 As of May 2012, there were only 53 LNG filling stations in the United States, compared with 157,000 selling gasoline. Analysts estimate that it will take about $60 billion to build a critical mass of LNG filling stations across the country. 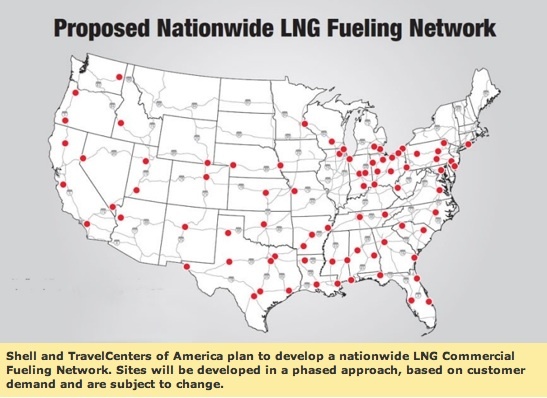 The plan is to construct at least two LNG fueling lanes and a storage facility at up to 100 existing TA and Petro Stopping Centers branded full service travel centers along the U.S. interstate highway system. Construction and opening of the LNG stations will be done in a phased approach. Pending customary approvals, we anticipate the first of these stations will be operational in roughly one year’s time with a priority to develop the main trucking corridors to provide the potential for the first-ever coast-to-coast LNG-fueled commercial transport network. Have we reached the tipping point for greater adoption of LNG long-haul trucks? Not yet, but we’re getting closer every day — as long as the price difference between natural gas and diesel, currently about $1.50 per gallon difference, stays large enough to cover the higher price for LNG-powered trucks (between $40,000 and $80,000 per vehicle) and other ancillary costs. For additional insights on this emerging trend, check out the articles below published in recent days, as well as the guest commentary written by Jason Craig at C.H. Robinson that we published back in February (C.H. Robinson is a Logistics Viewpoints sponsor). What are your thoughts on this topic? Are you looking to add alternative fuel vehicles to your fleet or operations this year? Post a comment and share your viewpoint!